She’s certainly one of my favourites – along with Richard Yates, Penelope Fitzgerald and Barbara Pym. It’s nice to see her getting the recognition she so richly deserves. Taylor and Pym are my favourites too.I agree short stories need to be dipped into now and again.I must re read A VIEW OF THE HARBOUR soon–i have only read it once about 10 years ago. Oh, I really loved A View from the Harbour – it’s one of my favourite of her novels. She captured the sadness of that community so well. Lovely review. 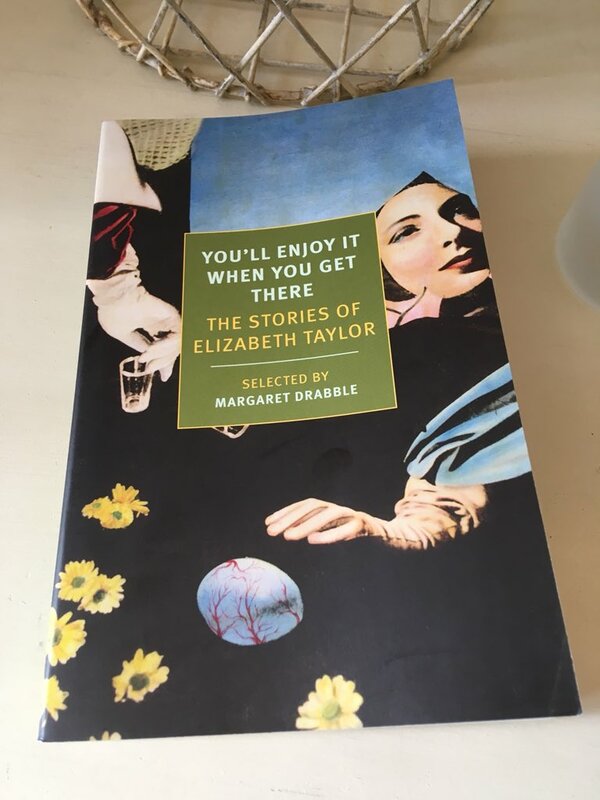 You capture Elizabeth Taylor’s ability to reveal those small but all important actions, thoughts, revelations which are the heart of her writing. I love her short stories as much as her novels. The idea of meeting someone known initially only as a letter writing correspondent is also used in A Wreath of Roses when a Morland Beddoes turns up to meet Frances for the first time, having bought a painting from her years before and corresponded ever since. We know people partially and in different ways, she seems to reveal. I think I will be going back to dip into my copy of her Complete Stories again very soon thanks to you review. Thanks, Caroline, for your lovely comment about Elizabeth Taylor (I know she’s one of your favourite writers too). She seems to have that ability to capture her characters in their most private of moments. As you say, it’s often those small yet crucial details that are so important, the little gestures and inner reflections which reveal something of a individual’s demeanour. How interesting to hear about the appearance of a letter writer in A Wreath or Roses, particularly as I’m hoping that will be my next Taylor. It’s next in the sequence, so to speak! I read several of Taylor’s novels many years ago – the lure of those old green Viragos! – but now that I’m a short story convert you’ve made me think I should pick up one of her collections. Is there one you’d particularly recommend? Well, if you can get hold of a copy of this NYRB I would thoroughly recommend you do so, particularly as it includes a selection of stories from each of her individual collections. They’ve almost certainly cherry-picked the best pieces. Failing that, you could go for The Blush – or one of her later collections, A Dedicated Man or The Devastating Boys. Whichever one you chose, you’re sure to be in for treat! I hadn’t heard of this particular collection. I have all Taylor’s short stories in various volumes. There is one collection of five that I still haven’t read, I think I have been saving it for years. Taylor is a quite wonderful short story writer, and those you talk about like The Blush and The Letter Writers come back so clearly to me. A sign, surely of a great storyteller. One of her stories I am unable to forget years later is called The Fly Paper. One of those Tales of the Unexpected was based on it, and was available on YouTube, and probably still is. It is shattering. Her keen observational eye is so suited to the short form. I must dig out that last volume Dangerous Calm and finally read it. You’ve done very well to save that final collection for so long — but then again, it’s always nice to have something to look forward to, especially if it’s by a favourite writer (which I know to be true in this case). The Letter-Writers is the one that will really stay with me, I’m sure. It’s been quite a few months since I read the first couple of stories, and yet in some ways it seems like only yesterday. Several images have remained in my mind, particularly those involving the debacle over lunch and the presence of Mrs Waterlow as she lingers in the room. The Blush is another keeper too. I think I’ve heard a little bit about The Fly Paper. Andy Miller may have mentioned it on Twitter or his Backlisted podcast? Either way, it sounds superb. I used to love Tales of the Unexpected as a child, so your comparison to Dahl can only be a good thing. I really need to read Elizabeth Taylor. Based on your commentary and other thinks that I have read on various blogs, I know that I would like her books. You raise a good point about the emotions thaf she wrote about being still recognizable. I think that universality over time is a component of great literature. Yes, indeed. Even though times have changes quite markedly, we can all relate to these feelings of disappointment, embarrassment and isolation – it’s just the social context and other circumstances that have changed. I think you would like this author very much, especially given your fondness for character-driven fiction. Her powers of observation and levels of precision are particularly good. Lovely review Jacqui. It’s tempting to seek out a copy, even though I have a lovely volume of complete stories which (whispers) I haven’t actually read yet! Having read all of her novels in fairly quick succession, I think I needed a break from her writing at the time. But maybe I should dust down the book soon. Her writing can certainly be quite devastating. Oh, that Virago edition of her complete stories is very appealing. I’m sure you’ll have everything you need right there whenever it takes you fancy. That’s understandable, the need to take a break after reading so many of her novels in quick succession – I’m guessing it was part of a readalong to celebrate Taylor’s centenary in 2012? Too much of a good thing, and all that. I recall you saying that you had a similar experience with Barbara Pym! Yes, the 2012 Virago readalong, and I ended up hosting one of the books early on in my time as a blogger. It was fun reading the books but quite intense. I burned out with Pym, though not with Taylor, but I definitely needed a gap! Gosh, that must have been nice but somewhat stressful! I still recall the responsibility of co-hosting the Reading Rhys event a few years ago. A very rewarding experience, albeit a rather busy one at the time. I take my hat off to you and Simon for hosting those every six months. That must be a significant amount of work – bravo! This sounds wonderful Jacqui. What a huge talent Taylor was, as you say she can craft perfect sentences, and they just stun the reader. For all of the emotional and psychological depth Taylor explores, she can be so funny. I’m definitely putting this on the list; it sounds as though Taylor is just as adept at the short form as in her longer novels. Some of her characters are quite wonderful! Mrs Waterlow is so nosy, pushing her way into the living room to get a better look at Emily’s visitor. She then proceeds to hang around in the background, observing the couple under the ruse of wanting to look something up in Emily’s Encyclopaedia. It’s very funny and excruciatingly painful at the same time. I’m sure you’d enjoy it. I love those little excerpts, so evocative and demonstrative of Taylor’s skill in skewering a character with an economy of words. I still balk at short stories, I’m not sure if I’ll ever quite get over that odd aversion (which doesn’t reflect in any way my actual enjoyment of the work) but it sounds like Taylor is just as much at home in the short form as the long one. Ha, I know what you mean about that aversion to reading short stories. It was the same for me for several years. I always seem to enjoy them once I get going, but I do have to push myself every now and again to pick them up. It often seems so much more appealing to go for a novel instead! Anyway, these stories are great – as you say, we’re in the hands of a writer who seems equally at home with both of these forms. For some reason I haven’t been reading many short story collections as part of ACOB and one of my reading goals post-ACOB is to read more short stories. I have the NYRB edition of Taylor’s stories and am looking forward to reading it now more than ever after reading your review. Oh, I’m glad to hear that you have the same edition as it’s a lovely piece of work. One gets that feeling that a lot of care and attention has been lavished on the selection of these stories and their presentation in the book. It really is a superb collection, definitely something to look forward to. I just realized I have two copies of the NYRB edition. Oops! I bought some big huge collection of her stories a while ago after being impressed with a few of her novels. That’ll be her collected stories, I suspect. A couple of her early ones are a bit uneven — but even so, it’s always interesting to follow a writer’s development over time. I own the same collection Guy mentions. I think it was a mistake as it’s so hard to hold. I only read the The Rose, The Mauve, The White and liked it as much as you did. I might go and read Summer Schools and The Letter-Writers they both sound so good. She has such a sharp eye. It is a bit of chunkster, that book! Mind you, it’s nice to have all her stories together in one place, especially if you want to read them in chronological order. I loved The Letter-Writers and I’m sure you will too – definitely one of the highlights of the Blush section for me. Yes, she was such a great observer of people and situations. And so economical with her prose, too – she had that ability to portray so much about a character by the way they spoke or carried themselves in company. I’ve been reading and loving her novels and have the NYRB volume on my TBR pile. I’m less of a short story person, but I may have to get reading. Thanks for the review! You’re very welcome! I think you’ll find lots of similarities between the novels and these short stories, particularly Taylor’s insights into her characters’ inner lives. I do hope you enjoy them.